Help the Franciscans make a difference! 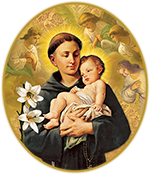 Companions of St. Anthony, please fill out and submit the form below. Yes, I'd like to join the St. Anthony Angels by making this a monthly gift! Click here to learn more. For ACH (bank account) transfers, please click here. Please fill out the following information to complete your gracious gift to The Companions of St. Anthony. Know that your gift transaction is secure as verified by the Norton security seal below. You will receive an email confirmation as soon as your transaction is complete. Otherwise, if your card is declined or you are missing information, error messages will be displayed above in red.